Turnout at Republican caucuses around the county on Tuesday can be described in a word: sparse. Whether it was because so few local offices are contested this year, because of competing community activities or because of disillusionment with politics, attendance at a sample of the neighborhood gatherings was a fraction of normal. In some years, upwards of 100 voters per precinct have showed up for caucus meetings. On Tuesday, fewer than 50 people showed up at Gunnison Valley High School for the six precincts in the Gunnison Valley. The ostensible purpose of the meetings is to elect delegates to county and state conventions. Those delegates will vote to decide which candidates go on the primary election ballot. But in at least one precinct, after every willing attendee had been appointed as a county convention delegate, leaders got on the phone to try to recruit people who weren’t there for remaining open slots. In Mt. Pleasant, everyone from Mt. Pleasant City was invited to North Sanpete High School. About 40 people showed up, and like in Gunnison, almost everybody there was appointed as a county convention delegate. Gatherings of Sanpete County Democrats are always small. Fewer than 10 percent of voters in the county are registered as Democrats. But Serenity Kimball, the party chairman for the county, was pleased that more than 30 turned out for a combined countywide caucus and convention Tuesday at the Noyes Building at Snow College. The deadline for filing for national, state and local offices was Friday, March 16. As of the deadline, the most notable local races are for county commission and for the Utah House of Representatives in District 58, which takes in most of Sanpete and Juab counties. Justin Atkinson, an engineer with Sunrise Engineering and a Mt. Pleasant city councilman is vying with Edwin Sunderland of Chester, a retired dairy farmer and long-time chairman of the Sanpete Water Conservancy District, for county commission. Both candidates initially announced they would gather signatures, an alternate route to the primary election ballot that was set up by the Utah Legislature a few years ago. . In Sanpete County, 235 Republican signatures are required to get on the primary ballot. 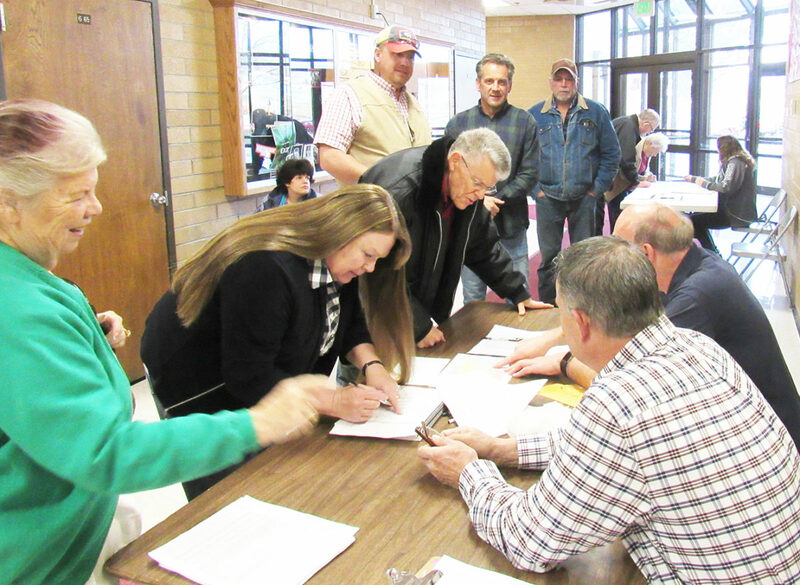 According to Sanpete County Clerk Sandy Neill, Sunderland decided to drop his signature-gathering efforts and compete based solely on delegate votes at the Sanpete County Republican Convention, which is scheduled April 19. Atkinson is going ahead with signature gathering and has a couple more weeks to turn in signed petitions. However, he will also be nominated at the county convention. If either candidate gets 70 percent of the county convention vote, the winning candidate goes on the ballot. If Sunderland gets 70 percent, and Atkinson has turned in 235 signatures, Atkinson can choose to drop out or to go on the ballot and compete with Sunderland in a primary. The other big race that emerged following the filing deadline was between Derrin Owens, incumbent in Utah House District 58, and Claudia Jarrett, who is retiring from the Sanpete County Commission. In 2015, after Jon Cox resigned from the seat, Owens defeated Jarrett in a special District 58 Republican caucus by three votes. Neither Owens nor Jarrett has announced intent to collect signatures, so both will compete at the Utah Republican Convention on April 21. The threshold for nomination is 60 percent. So if either Owens or Jarrett gets 60 percent of the convention vote, the winner goes on the final ballot as the unopposed Republican candidate. With Republicans being the overwhelmingly dominant party in District 58, a 60 percent vote at the party convention would practically assure election to the Utah House of Representatives.